Traveling with the bass is always a challenge. In particular traveling by air is getting more and more restricted and expensive for double bassists who want to take their in- strument aboard. 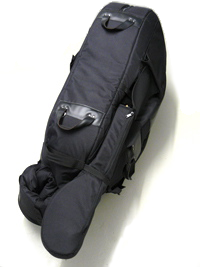 To make traveling with the bass easier, Christopher® has developed a double bass with a removable neck. As the makers of the Eminence Bass, Christopher has much experience in making portable basses with removable neck. Due to the steel dovetail joint, the neck is removed and assembled within a few minutes. For removing the neck, you start with tuning down the strings some turn, so you can remove the bridge. Then, release the strings from the tailpiece (which can stay on the bass). After loosening the neck screw, you slide the neck forward and store it (with the strings) in the neck bag. The softcase for the Christopher RN can be used for both the assembled and disassmbled bass. 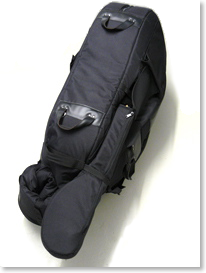 The removed neck is stored in a seperate pocket, which is slided into the softcase and secured with straps, the empty neck of the softcase is folded. The overall dimension of this package isn't much more than the dimension of the bass body w 70 x l 130 cm: small enough to fit you car's luggage space, train compartment, or even a bike trailer easily.